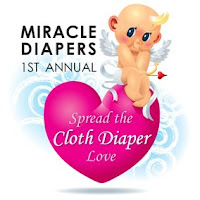 Miracle Diapers is right now having their 1st Annual Spread the Cloth Diaper Love event. Between now and February 28th, you can nominate someone to win a bundle of cloth diapers and accessories. There are a few rules for nominating someone, but otherwise there are no strings attached. The diapers will not be marked as “Miracle Diapers” and the winner(s) will not be required to return them unless they desire to do so. There could be multiple winners depending on how many diaper donations are made. If you know someone who’s about to have a baby and plans to cloth diaper, this would be a fantastic gift!